Solon—a wise man, poet, and leader—made some necessary changes in the government of Athens, but he also created problems that needed fixing. Cleisthenes' reforms were instrumental in converting earlier democratic tendencies into a governmental democracy. In the 7th century B.C., economic crises coupled with the start of the age of tyranny elsewhere in Greece—beginning in c. 650 with Cypselus of Corinth, led to unrest in Athens. In the final quarter of the century, the Draconian law code was so severe that the word 'draconian' was named after the man who wrote the laws. At the start of the next century, in 594 B.C., Solon, a widely traveled aristocrat, and poet was appointed sole archon to avert catastrophe in Athens. While Solon enacted compromises and democratic reforms, he kept the social organization of Attica and the Athenians, the clans and tribes. Following the end of his archonship, political factions and conflict developed. One side, the men of the Coast (consisting mainly of the middle classes and peasants), favored his reforms. The other side, the men of the Plain (consisting mainly of Eupatrids 'nobles'), favored restoration of an aristocratic government. Pisistratus (6th C. - 528/7 B.C. *) took advantage of the unrest. He wrested control of the Acropolis in Athens by means of a coup in 561/0, but the major clans soon deposed him. That was only his first attempt. Backed by a foreign army and the new Hill party (composed of men not included in either the Plain or Coast parties), Pisistratus took control of Attica as a constitutional tyrant (c. 546). Pisistratus encouraged cultural and religious activities. 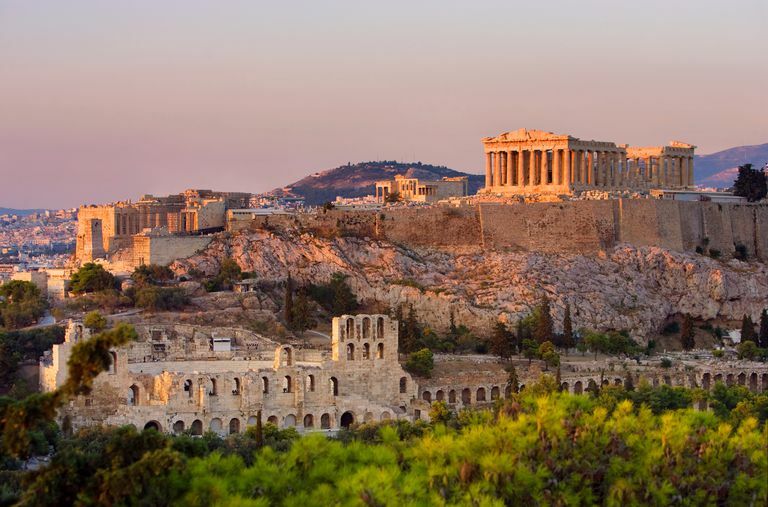 He improved the Great Panathenaia, which had been reorganized in 566/5, adding athletic contests to the festival in honor of the city's patron goddess Athena. He built a statue to Athena on the Acropolis and minted the first silver Athena owl coins. Pisistratus publicly identified himself with Heracles and especially with the help Heracles received from Athena. Pisistratus is credited with bringing rural festivals honoring the god of revelry, Dionysus, into the city, thereby creating the extremely popular Great Dionysia or the City Dionysia, the festival known for the great dramatic competitions. Pisistratus included tragedy (then a new literary form) in the festival, along with a new theater, as well as the theatrical competitions. He gave a prize to the 1st writer of tragedies, Thespis (c. 534 B.C.).
" Pisistratus died at an advanced age in possession of the tyranny, and then, not, as is the common opinion, Hipparchus, but Hippias (who was the eldest of his sons) succeeded to his power." Hipparchus favored the cult of Hermes—a god associated with small tradesmen—placing Herms along the roads. This is a significant detail because Thucydides uses it as a point of comparison between leaders in connection with the mutilation of the herms attributed to Alcibiades at the time of the Peloponnesian War.
" They did not investigate the character of the informers, but in their suspicious mood listened to all manner of statements, and seized and imprisoned some of the most respectable citizens on the evidence of wretches; they thought it better to sift the matter and discover the truth; and they would not allow even a man of good character, against whom an accusation was brought, to escape without a thorough investigation, merely because the informer was a rogue. For the people, who had heard by tradition that the tyranny of Pisistratus and his sons ended in great oppression...."
Harmodius was in the flower of youth, and Aristogiton, a citizen of the middle class, became his lover. Hipparchus made an attempt to gain the affections of Harmodius, but he would not listen to him, and told Aristogiton. The latter was naturally tormented at the idea, and fearing that Hipparchus who was powerful would resort to violence, at once formed such a plot as a man in his station might for the overthrow of the tyranny. Meanwhile Hipparchus made another attempt; he had no better success, and thereupon he determined, not indeed to take any violent step, but to insult Harmodius in some secret place, so that his motive could not be suspected. However, the passion was not returned, so he humiliated Harmodius. Harmodius and his friend Aristogiton, the men who are renowned for freeing Athens of its tyrants, then assassinated Hipparchus. They weren't alone in defending Athens against tyrants. In Herodotus, Volume 3, William Beloe says Hippias tried to get a courtesan named Leaena to reveal the name of Hipparchus' accomplices, but she bit off her own tongue so as not to answer. Hippias' own rule was considered despotic and he was exiled in 511/510. See "Politics and Folktale in the Classical World," by James S. Ruebel. Asian Folklore Studies, Vol. 50, No. 1 (1991), pp. 5-33. The exiled Alcmaeonids wanted to return to Athens, but couldn't, so long as the Pisistratids were in power. By taking advantage of Hippias' growing unpopularity, and by gaining the support of the Delphic oracle, the Alcmaeonids forced the Pisistratids to leave Attica. Back in Athens, the Eupatrid Alcmaeonids, led by Cleisthenes (c. 570 - c. 508 B.C. ), allied with the mostly non-aristocratic Coast party. The Plain and Hill parties favored Cleisthenes' rival, Isagoras, from another Eupatrid family. Isagoras appeared to have the numbers and the upper hand until Cleisthenes promised citizenship to those men who had been excluded from it. The Areopagus and archons continued, but Cleisthenes modified Solon's Council of 400 based on the 4 tribes. Each tribe contributed 50 members. Each deme contributed a number proportional to its size. Over time, each member came to be chosen by lot from those citizens who were at least 30-years old and approved by the outgoing council. Instead of having the unwieldy 500 sitting day after day for the year of their office, each tribe sat on the administrative and executive council for 1/10 of the year. These groups of 50 men were called prytanies. The Council could not declare war. Declaring war and vetoing recommendations of the Council were responsibilities of the Assembly of all citizens. Cleisthenes reformed the military, as well. Each tribe was required to supply a hoplite regiment and a squadron of horsemen. A general from each tribe commanded these soldiers. Information on the reforms of Cleisthenes is available through Herodotus (Books 5 and 6) and Aristotle (Athenian Constitution and Politics). The latter claims that Cleisthenes was also responsible for the institution of ostracism, which allowed the citizens to get rid of a fellow citizen whom they feared was getting too powerful, temporarily. The word ostracism comes from ostraka, the word for the potsherds on which the citizens wrote the name of their candidates for the 10-year exile. The numbers (1-10) are hypothetical. *'Aristotle' Athenaion politeia 17-18 says Pisistratus grew old and ill while in office, and died 33 years from his first time as tyrant. "The Career of Peisistratos Son of Hippias," by Michael F. Arnush; Hesperia Vol. 64, No. 2 (Apr. - Jun., 1995), pp. 135-162. What Happened During the Age of Pericles? How Did Athens Become a Democracy? What Is the Ancient Definition of a Tyrant?